At a five-a-side pitch in north Glasgow, an Olympic gold medal-winning squad is being put through its paces. Three football teams - which include several world championship gold medal players - are making their final preparations before a national competition next week. On Monday, all these players will be in Scotstoun, Glasgow, boarding coaches to Sheffield to attend the UK's 10th Special Olympics National Summer Games. Scotland will be sending about 500 athletes from across the country - the largest contingent in the UK outside this year's hosts. The training session at the Firhill Complex is low key, with no hint of the achievements many of the players on the pitch have under their belts. There's a lot of laughter - and the occasional exclamation of frustration when a shot goes wide or a pass is missed. But if you thought for a minute there was a lack of seriousness or focus in this last training session before the trip to Sheffield, you'd be wrong. "I'm going the Sheffield to get the gold, nothing else," says 29-year-old footballer Derek Taylor. "You've got to go and try to win it all." The global Special Olympics movement was founded in 1968 by Eunice Kennedy Shriver for people with an intellectual - or learning - impairment. But going to the games is a way for the athletes to get away from the labels that are often applied to them, says Gordon McCormack, the head of delegation for the Scotland West squad. "Many of our athletes don't want to call themselves disabled," he tells BBC Scotland. "The issue is that they've been labelled as such by society. What we're trying to do is help them through that transitional stage and into everyday life where they can perhaps find a job, get married, drive a car and just get on with life." It's a mission that gets to the very core of what the games are about. "Eunice Kennedy Shriver founded the games way back in 1968. What she was trying to do was support people with a learning disability within the community at large," he says. "What she wanted to try to prove is they have the right to live alongside you and I as equals." Image caption Derek Taylor: "This gives people chances that don't usually get chances"
"I've been playing football for 14 years. This gives people chances that don't usually get chances. It's much better knowing that you're representing a team rather than just playing about on a pitch. I'm going the Sheffield to get the gold, nothing else. You've got to go and try and win it all." There are six regional teams from Scotland attending the games and the athletes will be up against others from regions across England and Wales. "They've been training now for over two years, fundraising for over two years and it's a hugely exciting occasion for all of them," Mr McCormack says. "We've got many talented players. Some of these players have already been to Shanghai, to Athens, to the world games - so they're looking forward to going again and competing for the GB title." Glasgow West striker John Maxwell has been part of the squad since he was 14 and has already been to three world games. The 31-year-old helped the Great Britain team win gold at the world champions in Los Angeles two years ago - an occasion he marked with a tattoo on his left calf - and is now an assistant coach for Glasgow West. "I've been to Los Angeles, China, I've also been to Greece and I've also done a European competition in Germany - that was an invitational thing just before the 2006 World Cup which we did pretty well in as well," he says. Before he joined the football squad, Mr Maxwell competed in athletics, winning three golds in two national competitions - for the 100m with a time of 11.7s and in the 200m with a time of 24.08. He picked up his third gold in the 4x100 relay. The first gold was at a home national games in Glasgow and he happily admits that receiving the medal brought a "tear" to this eye. He says he's still excited to be competing - but it's not the only reason he enjoys the weekly training sessions so much. "It's special. You're developing friendships and a team bond. "We're planning to go down there and win - gold, silver, bronze it doesn't matter. As long as they try their hardest it makes me proud." Image caption Sean McCulloch: "My main aim is to win a medal but if I can't I just need to do the best effort I can." "Going to Los Angeles in America for the first time and getting to the final and winning the gold was the best feeling ever. I was playing outfield in that tournament and it went to penalties. 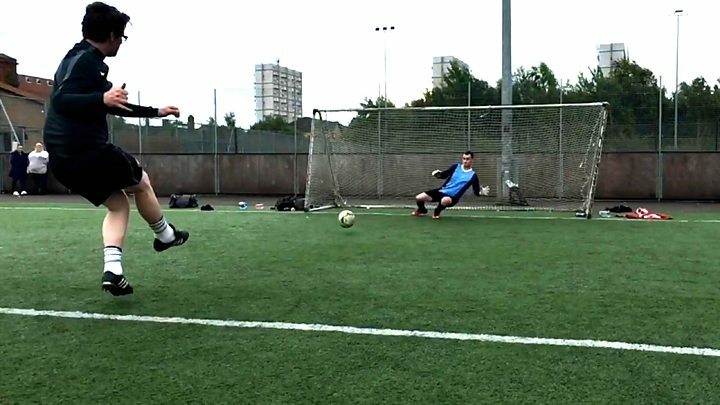 Just before it went to penalties they put me in goal and I saved one of the penalties that practically won the world games. It was just amazing out there. My main aim is to win a medal but if I can't I just need to do the best effort I can." The football teams at the Special Olympics compete in divisions depending on ability. All three Scotland West teams going to Sheffield - two in the premier division and one in division three - have won medals in recent years. PE teacher Craig Milne, who coaches the Special Olympics Glasgow West squad, says he is hoping to build on this success - despite some stiff competition from the English and Welsh contingents. "They're looking good. We've got quite a lot of players here who are in the Great Britain Squad who were world champions in 2015. "We've got two teams playing against each other in the top division so it'll be interesting when we get down there to see who comes out on top." But whatever their level of experience, Mr Milne says all the players are serious about playing - and winning. "For the competition itself they're down there and they are athletes for the duration. They eat well, they sleep well, they rest well," he says. "We prepare for all the games. It's a professional environment these guys will be in for the next few days. An experience they'll probably remember for the rest of their life."